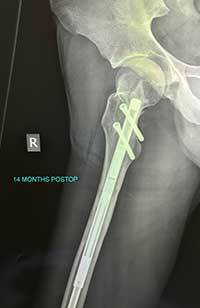 The PRECICE Lengthening Nail is an internal rod or device used to lengthen the femur (thigh bone) or tibia (shin bone). It can be used for lengthening a shortened bone after trauma, infection, disease and for a congenitally shortened bone. The PRECICE Lengthening nail is a two part telescopic rod with a magnetic distraction component (lengthening device). The lengthening programme of the nail is prescribed by Dr O’Carrigan and is based on your clinical assessment (check up) and X ray measurements taken at your Out Patient appointment. How does the PRECICE Lengthening Nail work? 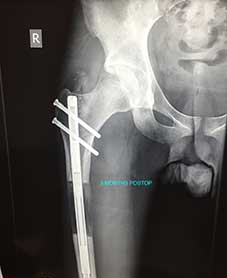 During anaesthetic the nail is inserted into the center/hollow canal of the shortened femur (thigh bone) or tibia (shin bone) and held into place with screws at each end. Then small surgical incision/s (cuts) are made through which the surgeon cut the bone/s. 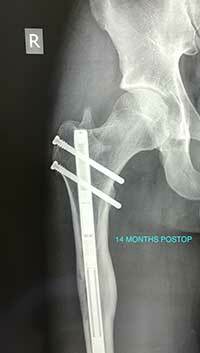 This is referred to as a corticotomy/osteotomy. The surgical wounds are then sutured (stitched) with dissolvable sutures and covered with waterproof dressing/s. All patient return to the ward with a Patient Controlled Analgesia (PCA) with a pain management protocol set with your anaesthetist and regular nurse monitoring. You will have a urinary catheter to assist with passing urine (water) until your PCA is down and you have mobilized from bed within 12-24 hours of surgery with our physiotherapist/s. Other pain relief will be offered as required. Your can eat and drink after your anaesthetic as directed by your nurse. Between day one and three post insertion of the Nail you will have a repeat X ray to check the position of the nail and once you have adequate pain control and have been cleared by the physio you will be discharged home with a follow up date with Dr O’Carrigan of between 10-14 days. At the first postop visit Dr O’Carrigan or his team will remove the dressings and sutures and the lengthening will commence using the ERC.. Lengthening is achieved by following demonstrated instruction regarding the lengthening technique with the External remote control (ERC) and the exercise regime provided. 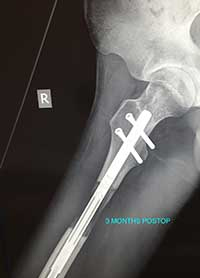 Over the next few days and weeks the two ends of the telescopic rod (nail) slowly pull apart creating a gap in the bone. This phase is referred to as the Distraction phase (lengthening phase). You can expect to be reviewed at least fortnightly during this lengthening process/phase with X rays taken at each visit to access your progress of distraction (lengthening / correction) while mobilising (walking) on crutches with only toe touching to protect the nail and new bone. Once the nail is out to length the distraction phase is complete however osteogenesis (creation of new bone in the gap) continues. This is referred to as the Consolidation phase (hardening of the new bone formed in the gap). At this point you would be expected to come for review once a month, with ongoing physiotherapy at home while back at work / study at least part time. 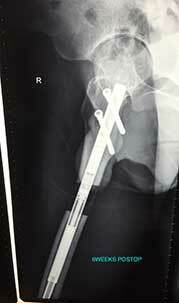 You would remain on crutches and slowly increase weight bearing status as the bone consolidates in the gap. Dr O’Carrigan will advise when you can commence full unrestricted weight bearing and this judgement is based on the X-ray and clinical appearances. Once the bone is consolidated (hardened) Dr O’Carrigan will request less frequent follow up appointments and you will be encouraged to mobilize with out crutches gradually. At your appointment you will meet with Dr O’Carrigan he will take a detailed history and examination and provide a report to your referring doctor and copy it to you for your perusal. There will be a follow up appointment in the light of that advice where a decision of whether or not to proceed to surgery will be made. 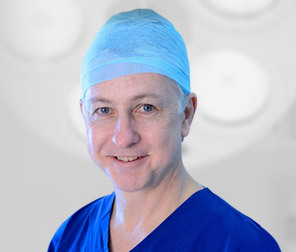 If the decision is to proceed then Dr O’Carrigan will have a detailed discussion with you about the potential risks and complications of the procedure and explain the expected clinical course. A record of the preoperative discussion will be made and an admission form for the relevant hospital completed with the consent. My staff will prepare a detailed quote so you are fully aware of the costs of the proposed surgery. The hospital will inform you by telephone with instruction for admission and fasting times. The expected length of hospital admission is 3-5 nights. Surgery is on the same day as admission. The anaesthetist will review you in the anaesthetic room prior to surgery and discuss a pain management plan after surgery. The Medical, Nursing and Allied health staff at the hospital will provide care and management to you and your family under the supervision of Dr O’Carrigan. It is expected that you will mobilize from your bed with 12 – 24 hours after surgery on crutches / rolator with assistance from our physiotherapists. Early mobilization is important in terms of reducing risks associated with surgery and anaesthetic. An X ray will be taken prior to discharge and pain medication will be dispensed on discharge to provide ongoing pain relief during the lengthening phase and a follow up appointment booked with the LRS team. The Precice lengthening nail allows controlled and precise correction of leg length discrepancies with a higher union rate and lower complication rate than previous lengthening nails. Please contact our office on 02 96021113 if you would like to consult Dr O’Carrigan to see if this procedure is suitable for you.